There are lots of opinions about how to reduce global emissions of greenhouse gases. A carbon tax is frequently presented as the preferred choice of most economists, and it is a carbon tax that Ontario is ideally suited to introduce to its electricity sector. There need be no immediate costs to most consumers in introducing a tax which promises significant benefits. A carbon tax could fulfil a political need, both domestically and internationally, to do something that is perceived as being about reducing greenhouse gas emissions. Every government wishes to present itself as active in reducing emissions. For the incumbent Ontario government that will be important as the province is planned to enter a period of increasing emissions in its electricity sector. More significantly, Ontario could exert an influence beyond it's borders by introducing a very significant carbon tax in its electricity sector, and it could do so painlessly. 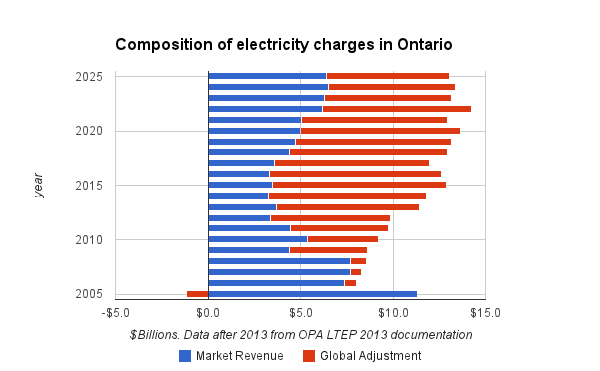 Since 2005 Ontario has recovered the cost of its electricity supply not simply through market rates, but through an additional "global adjustment" charge calculated to capture supply costs the market does not. That charge has been above $5 billion a year since 2010 and is anticipated to remain so for the next decade. Currently the global adjustment consists primarily of the costs of procuring supply less the money recovered from the sale of the supply to consumers. One very contentious aspect of carbon taxation is what should be done with revenues. That should not be debatable in Ontario's electricity sector, because the revenues could simply be used to decrease the global adjustment charges currently payable by Ontario's consumers. The more contentious aspect of carbon taxation is the revenue collection. Residential and small business customers on regulated price plans are unlikely to see a change with the introduction of a carbon tax as they only view a blended rate regardless. Larger customers that are billed on a combination of their hourly consumption at the market's hourly rates, and the global adjustment, would see more of their total charges based on usage during periods when more carbon dioxide is being emitted by generators. That is the intent of pricing emissions. The level of the tax need not be contentious because Ontario is well suited for introducing a much higher carbon tax than the few jurisdictions that have already levied one. There are two reasons for this: Ontario's electricity generation is currently low-emission, and Ontario already pays a large amount of money, outside of market rate recoveries, to finance fossil fuel generators. In 2005 the government contracted new gas-fired generation with a "net revenue requirement" (NRR) contract structure that assured generators a return on investment for keeping the plant available. Those initial contracts immediately saw Ontario Power Generation (OPG) negotiating reliability-must-run (RMR) payments to keep the Lennox generating station available. The government continued to contract natural gas-fueled generators with NRR's, and when demand, and market pricing, dropped significantly by 2009, OPG began to receive contingency payments to keep coal-fired generators operating until the government and system operator were confident they could be removed from service. These are all types of capacity payments, and my estimate of those costs show they grew by about $1.35 billion a year from 2005 to 2013 while CO2 emissions dropped, according to the Ontario Power Authority (OPA), by 26 MegaTonnes. Jurisdictions that have driven the growth of variable intermittent renewables now look for mechanisms that allow dispatchable generators to be available to meet demand in any circumstances including still, dark, nights. A former German Environment Minister resisted capacity payments, stating: "I am against blanket subsidies for fossil energy, which would only increase power prices." I don't agree with the term "subsidy" here, but it would be politically desirable for capacity payments to be paid for, as much as possible, through the taxation of carbon. The OPA projects carbon emissions will remain relatively stable before moving upwards around 2020 as the Pickering nuclear generating station is removed from service. I suspect the NRR contracts will last until the latter part of the decade, so it's possible to estimate a carbon price using the assumption it will recover much of the costs of capacity payments to natural gas, and oil-fired, generators. It is ~$125/tonne of CO2 equivalent (tCO2e). Back-testing $125/tCO2e shows it may be the figure required to stimulate a society to decarbonize. In 2005 Ontario, 2 years into the mandate of a Premier who had come to power promising to end coal-fired generation, wasn't getting coal replaced. A report (.pdf) was commissioned that continues to be used to claim the cost of coal-fired generation in Ontario was $4.4 billion a year. The report didn't say greenhouse gas emissions costs anything in particular, but future references indicate few acatually read it - and some that did disagreed convincingly (.pdf). Regardless of the actual content of that 2005 report, it was trotted out time and again in a narrative of phasing coal being both the single largest carbon reduction project in North America and saving a hidden cost of $4.4 billion a year. 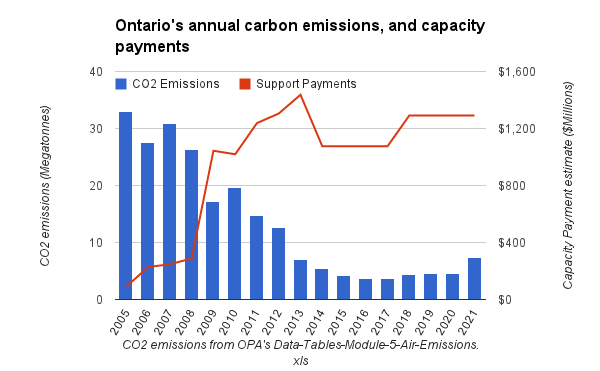 At $125/tCO2e, Ontario's 2005 emissions are valued a little over $4 billion. $125/tCO2e is a figure that both matches up with the costing of emissions that inspired action in the past and coincides with capacity payments in the future, which doesn't mean it is the proper level for pricing greenhouse gas emissions, but it does mean it can be justified in Ontario. Doing so would be irrelevant to most ratepayers and it may return some semblance of healthy market pricing by alleviating the negative impact of Ontario's capacity payments. Market pricing in Ontario is, when demand is sufficient, set by the price of natural gas. An Ontario carbon tax would prevent the subsidizing of exports from gas-fired power plants which occurs whenever Ontarian's pay the capital and non-fuel operating costs of the plant through the global adjustment while those importing from Ontario pay only the fuel portion of the production costs. There are certainly reasons to object to a $100+/tCO2e carbon tax in the electricity sector. There is no good reason to confine the tax to the electricity sector aside from expediency - as that is the sector that can accomodate it. The same is true for introducing the tax in Ontario and not everywhere. The United States considers a social cost of carbon in policy planning, and the level it considers is currently well below $125, but well above most carbon pricing that exists. British Columbia has a carbon price, but no plans to raise it above $30 to a level that might be more meaningful according to many estimates. Chile just announced the introduction of a small $8/tCO2e tax that prices emissions about as the European Unions Emissions Trading System (EU ETS) does, and China's emerging carbon trading markets will. None of these trading systems is obviously reducing emissions though, while the CO2e intensity of Ontario's generation is likely to fall to near 50 g/kWh for 2014. The reasons to support a $100+/tCO2e carbon tax can outweigh the objections that come from others not implementing significant carbon pricing. In Ontario's case, it could be the first of taxes introduced to rectify the inanity of a privatized power system with not a single participant exposed financially to market pricing. The carbon tax can make the market healthier; a tax on all generators to fund capacity payments required to ensure the continued operation of reliably dispatchable generators would be equally valuable in returning some sanity to market pricing and improving the valuation of generators that has been ignored for most of the past decade. 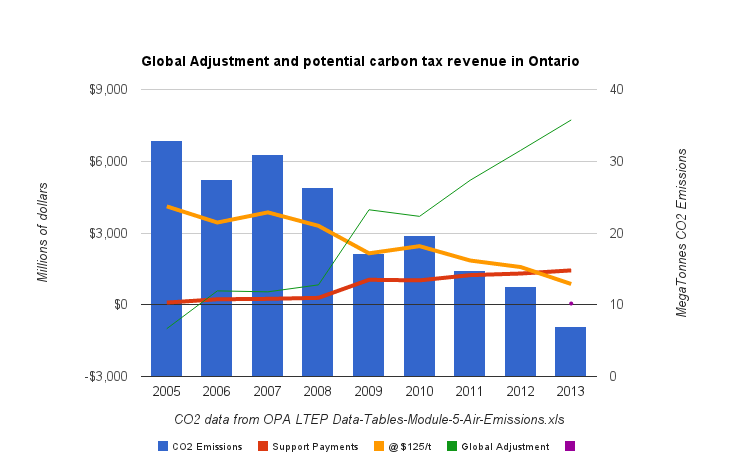 The introduction of a carbon tax in Ontario could be an example for other jurisdictions, particularly those impressed by Ontario's performance in reducing greenhouse gas emissions in its electricity sector, but within Ontario the introduction of a carbon tax would be valuable in instigating the introduction of something else. Emphasising a social cost of carbon by instigating it as a tax would elevate planning sophistication to include numbers and system functionality. At $125/tCO2e, as expensive as it sounds, initial feed-in tariff pricing would not have been considered cost competitive, and the expensive conversion of the little used Atikokan generating station, from coal to biomass, would not have been undertaken. Ontario does not need a carbon tax in it's electricity sector, but the pricing of carbon would support what it does need - either a political detachment from a competitive market designed with appropriate parameters, or the abandonment of that market and improved tools to cost various supply scenarios. Standards are politically pretty boring. They are effective, but not immediately so and therefore lack a marketing value. An incumbent government's ability to develop a base and gain both campaign funds and manpower is much greater in picking winners through the subsidization of specific technology (often wind and/or solar) and people (preferably party mandarins). While the option of selecting and subsidizing winners is politically attractive, it can have costs down the road - being basically a policy of taking from many to fund a few. It's also problematic that the countries with the highest subsidies don't seem to be performing well either economically or in reducing emissions. Two forms of economic tools are cap and trade, which usually features giving quota/cap to incumbent generators at least initially, and a carbon tax. Cap and trade (CandT) has been attractive politically for much the same reasons as the picking winners to subsidize has. Allocating the cap can protect a constituency - and that's how CandT has been used. The EU ETS is the most widely known CandT system. Its existence was used to justify Germany's abandonment of nuclear power - because the cap would take care of emissions. This is an indication a cap is as likely to prevent reducing emissions as to stimulate reductions. The most prominent American CandT mechanism has been the Regional Greenhouse Gas Initiative (RGGI). I have not seen any evidence that the RGGI capped emissions below levels that a business as usual (BaU) analysis would not have seen regardless. A carbon tax was contentiously presented into Australia, where the public resistance and a looming election saw it quickly downgraded by planning integration with the European Union Emissions Trading System (EU ETS). So ... how about carbon taxation? The International Monetary Fund (IMF) recently called for carbon taxes, and the World Bank recently collected 73 countries claiming support for a price on carbon. The general consensus seems to be that a carbon tax must be broad, and preferably universal. This seems unlikely, and more voices now call for regional deals such as the EU ETS, RGGI, or BC's carbon tax. All of these deals start low with the hopes they'll stimulate others to price carbon, but all are gamed systems with low costs. I think Ontario is positioned to test the argument that the primary goal should be establishing a social cost of carbon, and the best way to do that is to introduce carbon pricing in a sector at the full cost immediately. I sketch out my price estimates, by supplier, on my supply costs data page. 2. Demand usually doesn't allow gas to set the price - so the price is set either by export markets, often as dumping, or the cost of curtailing must-take supply. 3. In this series on Twitter, I look at a chart and ask if the RGGI had ever set caps at, or - almost inconceivably- below BaU expectations.